Favorite movies – everybody has some. Mine include Almost Famous, American Beauty, Billy Jack, Casablanca, Grease, Rear Window, Serenity, Some Like It Hot, the Bourne trilogy and last year’s big-screen Veronica Mars flick, among others. A few are stone-cold classics. Others – some might call them mediocre or even dreck. But, so what? I enjoy them. Beyond the Sea, the 2004 Kevin Spacey film about Bobby Darin, is yet another favorite. It’s flawed, for sure – and something I may never have seen save for my mother-in-law, who loves going to the movies. As a result, for a time last decade, we did just that. In this particular instance, the film before had been a bore – a French film that should have been called Ennui. Ennui, Part II, was next on the docket – if my mother-in-law had her way, that is. Diane, however, suggested we see the new Kevin Spacey movie instead as a way of placating me. Understand, all I knew about Darin at the time was “Splish Splash” and “Dream Lover”; and only from hearing them on Happy Days and Michael St. Johns’ Saturday night oldies show in the mid-to-late 1970s. Darin made his mark, of course, when he graduated from pop ’n’ roll to “Mack the Knife” and became an adult-contemporary/supper-club performer with a knack for making every song he sang his. That’s how I describe him now, mind you. In December 2004, however, when presented with the option of seeing Beyond the Sea, I simply figured: It’s Spacey. Non-French. Why not? Suffice it to say, the movie proved to be a revelation. Spacey’s performance led me to buy the soundtrack, and then an actual Darin best-of, which in turn led to various live sets and studio albums. The movie also led, indirectly, to more than just Darin. Prior, I gave short shrift to the supper-club musicians of yore – I was a kid of the late ‘70s and early ‘80s, after all, raised on rock, pop, country, folk, R&B and soul. I’d been led to believe that Darin and what (I mistakenly thought) he represented just weren’t cool. Beyond the Sea taught me that I was wrong. A year-or-so later – yes, that’s how long it can take me to pull the trigger on a purchase (I am great at not making up my mind) – I plunked down $33 for the 4-CD Singles Collection. The sales price was too good to pass up. My short-and-simple review of the set, then and now: There aren’t enough superlatives to describe it. At her best, regardless of genre (and the collection veers from big band to swing to late-‘60s/early ‘70s adult contemporary), she’s living the lyrics as she sings them – happy, sad, sensual, world-weary, what have you. Over time, the set led to other Peggy Lee albums, both on CD and iTunes and/or Amazon downloads – especially the latter, due to Amazon’s (at the time) frequent sales. 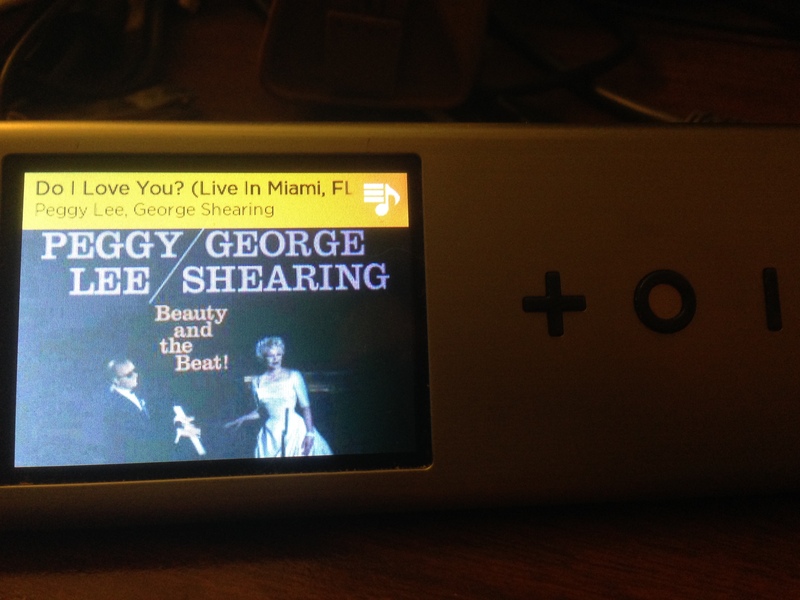 One download, from Amazon, was her collaboration with legendary jazz pianist George Shearing, Beauty and the Beat! At $2.99, it was a steal; and it quickly became my second favorite Peggy Lee set, with only the sultry Black Coffee ranking ahead of it. Those were the days, I hasten to add, when I couldn’t discern a difference between CD-quality and downloads – not because of my ears, but my speakers. Most of my listening, then and now, comes here, at my desk – and my desktop computer speakers at the time, while decent, just weren’t good enough. CDs, downloads and YouTube videos sounded the same; and because I made mix CDs from what was on my computer for the car, what I heard on my car’s speakers sounded as good (or bad, depending on how one looks at it). It wasn’t until I upgraded the speakers in 2010, after a year-plus of deliberating, that I realized how foolish I’d been. The thousands of CDs that I’d encoded at 256kbps and 320kbps became a figurative albatross around my neck. Mind you, the sound is akin to FM radio – decent, if somewhat distant and thin. And the albums and songs I’d bought at those bit-rates were… a sign of my ignorance. That’s why, in 2010, I began encoding everything as ALAC (the Apple equivalent of FLAC). Sure, they took up more room – but the sonic results were more than worth that (small) sacrifice. Well, last night, thanks to a birthday gift (certificate) from my friend Luanne a few weeks back, I downloaded Beauty and the Beat! from HDTracks.com in full 24-bit, 192kHz glory – that means the master tape (or close equivalent) was encoded into digital at those settings and, for download purposes, not dumbed down to 16-bit/44.1kHz CD settings (or worse). I.e., it’s as close to the original as possible. I loaded the album onto my Pono Player and…wow. Just wow. The Amazon download sounds decent – like I said above, akin to FM radio. The high-res download, on the other hand, sounds like Peggy Lee is singing in my ear. The set, I should mention, is billed as live, but is actually a studio set with the applause spliced in. Shearing and band have some wondrous instrumentals – especially “Mambo in Miami” and “Isn’t It Romantic”; Shearing’s piano reverberates as if you’re in the room with him, and the percussion…have I said “wow”? Check out the bass run on “Satin Doll.” The reason for purchasing it, though, is Peggy Lee. Her vocals are beyond belief. “Do I Love You,” “I Lost My Sugar in Salt Lake City,” “Blue Prelude,” “Always True to You in My Fashion” and “There’ll Be Another Spring” sound – well, I already said it’s like she’s singing in your ear. If you close your eyes, you’ll swear that’s the case. It makes me yearn to hear Black Coffee – both the album and title track – in high-resolution. And, listening to “Blue Prelude” as I type, I realize that I have none other than Kevin Spacey – and my mother-in-law, of all people – to thank for introducing me to Peggy Lee. If not for her penchant for movies, and Spacey’s decision to make Beyond the Sea, I never would have discovered Bobby Darin and, through him (and Amazon), Peggy Lee. And if not for Peggy Lee, my discovery of Melody Gardot – her modern-day heir, in my opinion – might not have happened. The point of this too-long post? Don’t discount the decades that came before one’s birth; nor genres of music you assume you’ll dislike. There are too many good sounds to be enjoyed; and history to be learned. Oh – and the Pono Store needs gift certificates.